José Gregorio Osuna (pronounced "o-SOON-ah")...Wife's name is Karla...Has two children; son Gilberto (9) and daughter Karla Sophia (5)...Attended Colegio Nuestra Del Fatima...Played baseball and soccer while growing up...Has participated in the Venezuelan Winter League each of the last five offseasons; was named the league's Rookie-of-the-Year while finishing fourth in the MVP voting in 2015...Signed by Pirate scouts Rene Gayo and Rodolfo Petit. Led the Pirates in home runs (5) and RBI (16) in spring training for the second straight year...Began season with Triple-A Indianapolis and hit safely in each of his first 13 games thru 4/23, going 15-for-45 (.333) with six doubles, a home run and eight RBI while making 12 starts at third base and one in right field...Was recalled by Pittsburgh on 4/25 to serve as the 26th man for the doubleheader against Detroit and hit a three-run homer in his first at bat while playing right field...Was optioned back to Indy following the game...Was named the International League's Player-of-the-Month for April after hitting .361 and leading the league in extra-base hits (12) and slugging percentage (.656); was also tied for second in RBI (16), doubles (nine), and total bases (40)...Was leading the International League in OPS (1.037), slugging pct. (.628) and doubles (12) when he was recalled a second time by Pittsburgh on 5/8...Hit his second career pinch-hit home run on 5/11 off San Francisco's LHP Andrew Suarez...Batted second in the starting lineup for the first of two times on 5/13 vs. San Francisco and went 2-for-4...Collected one hit his next 13 at bats thru 5/24...Was optioned to Indianapolis when Starling Marte came off the D.L. on 5/26...Hit .351 (20- for-57) with six doubles, a homer and 12 RBI in 14 games with Indianapolis during the month of June...Was recalled by the Pirates on 6/18...Snapped an 0-for-18 streak in the big leagues with an RBI-single on 6/26 at New York...Went 2-for-17 in nine games before being optioned back to Indy on 7/2... Hit .273 (21-for-77) with a homer and nine RBI in 21 Triple-A games in July...Was recalled a fourth time on 7/28 when Josh Bell went on the disabled list...Went 3-for-17 with an RBI in seven games with the Pirates between 7/28 and 8/5 before being optioned back to Indy on 8/8...Was named International League Player-of-the-Week for the week of 8/20-26 after hitting .478 (11-for-23) with three home runs, nine RBI, four runs scored and a 1.370 OPS in six games... Was recalled a fifth and final time on 9/1 and hit .279 (12- for-43) with six doubles, a home run and three RBI in 21 games during the month of September...Made his first Major League start at third base on 9/8 vs. Miami...His home run on 9/26 at Wrigley Field was his first with the Pirates since 5/11...Made a total of 11 starts at first base, six at third base and five in right field for Pittsburgh. Hit .407 in spring training while leading the team in home runs (5) and RBI (17)...Led all Grapefruit League players in batting average and ranked second in slugging percentage (.759) and OBP (.492)...Also tied for second in RBI...Began season with Triple-A Indianapolis, where he hit .250 (9-for-36) with five doubles and a RBI in 10 games thru 4/16...Was recalled by Pittsburgh on 4/18 when outfielder Starling Marte was placed on the Restricted List...Made his Major League debut on 4/18 at St. Louis and grounded into a double play as a pinch hitter in the seventh inning...Tripled off New York's CC Sabathia for first Major League hit while making first big league start (right field) on 4/21; the first Pittsburgh player since Chase d'Arnaud on 6/24/11 to collect a triple for his first big league hit...Recorded his first career four-hit game on 4/28 at Miami...Made his first big league start in left field on 5/2 at Cincinnati...Connected off Milwaukee's Zach Davies for first big league home run on 5/7...Made his first Major League start at first base on 5/9 at Los Angeles...Delivered a game-tying, two-run single with two outs in the ninth inning on 5/24 at Atlanta; also homered in the 10th inning...Hit .324 (11- for-34) with seven RBI in 17 games during the month of June... Batted second in the starting lineup for the first time in his career on 7/1 vs. San Francisco...Had an outfield assist on two consecutive days on 7/6 at Philadelphia - the first Pittsburgh outfielder to do so since Gary Alexander on 9/7/81...Had a total of three outfield assists on 7/6; the first Pittsburgh outfielder with three assists in the same game since Cecil Espy on 8/12/91... Connected off St. Louis' Josh Lucas for first career pinch-hit home run on 8/19...Homered in his very next at bat on 8/21 off Los Angeles' Alex Wood - his first and only Major League home run off a left-handed pitcher...Went 2-for-28 after homering on 8/21, going hitless in his final 14 at bats...Made 25 appearances (19 starts) in right field, 23 appearances (14 starts) at first base and 14 appearances (9 starts) in left field for the Pirates...Hit .248 (37-for-149) with 10 doubles, four homers and 23 RBI in his 42 starts...Went 6-for-50 (.120) with a homer, two RBI and one walk as a pinch hitter...Hit .321 (25-for-78) with four homers and 14 RBI in 22 games while playing for Bravos de Margarita in the Venezuelan Winter League. Led all Pittsburgh minor leaguers in RBI (69) and tied with Max Moroff for most games played (133)...Hit .279 (132-for-473) with 37 doubles, four triples, 13 home runs and 69 RBI while splitting the season between Double-A Altoona and Triple-A Indianapolis...Was named Indianapolis' Offensive Player-of-the-Year despite spending just half the season with the Indians...Began campaign with Altoona...Went 3-for-4 and had four RBI while finishing a home run shy of the cycle on 5/23 vs. Akron... Led Indianapolis in batting average, slugging percentage and tied for the most RBI after being promoted from Altoona on 6/30...Recorded 27 extra base hits from between 6/30 and 9/5, which ranked fifth in the International League in that time...Six of his seven home runs at Triple-A were either game-tying or gave Indianapolis the lead... Hit safely in a team-high tying 14 straight games from 7/16-30, which included home runs in three straight games during the streak...Homered twice on 8/3...Hit .321 with 19 RBI and 12 multi-hit games during the month of August...Hit .353 (18-for-51) with RISP while playing for Indianapolis...Made a total of 82 appearances at first base, 28 in left field and 16 in right field between Altoona and Indianapolis...Hit .279 (62-for-222) with three homers and 30 RBI while playing for Bravos de Margarita in the Venezuelan Winter League. Led all Pirates minor leaguers in RBI (81) while also finishing tied for fourth in games played (129)...Hit a combined .286 (142-for-497) with 32 doubles, three triples, 12 home runs and 81 RBI between Single-A Bradenton and Altoona...Began season with Bradenton, where he was named to the Florida State League's mid-season All-Star team...Went 4-for-4 with a pair of doubles on 4/23 at Jupiter...Was promoted to Altoona on 5/29 and went 2-for-3 with three RBI in second game with the Curve on 5/30 vs. Binghamton...Collected a career-high six RBI on 8/22 at Bowie...Set an Altoona record with five runs scored on 7/21 vs. Erie (game one)...Was named the Venezuelan Winter League Rookie-of-the-Year while also finishing fourth in MVP voting after hitting .330 (70-for-212) with 13 doubles, nine home runs and 30 RBI in 59 games for Bravos de Margarita. Spent second straight full season with Bradenton...Ranked second in the Florida State League in slugging percentage - trailing only teammate Josh Bell...Also finished fifth in batting average in the league and ranked third among Pittsburgh farmhands in that category...Hit .343 (36-for-105) with 22 RBI in 30 games during the month of August. Spent entire season with Bradenton...Hit .294 (63-for-214) at McKechnie Field compared to .200 on the road...Hit safely in 10 straight games from 7/29 to 8/12...Played in eight games for Magallenes in the Venezuelan Winter League following the season. Spent entire season with West Virginia...Finished tied for second among Pirates minor leaguers in home runs and fifth in RBI...Hit safely in 14 straight games from 8/8-22...Hit a club-record nine home runs during the month of July. Finished tied for second in the Gulf Coast League in hits and doubles and third in batting average...Hit .392 (31-for-79) during the month of July... Recorded first career multi-homer game while also knocking in five runs on 7/5 against the GCL Tigers...Was promoted to State College for the final two games of the season...Went 2-for-5 with a double and RBI in his New YorkPenn League debut on 9/3 at Williamsport. Led the Venezuelan Summer League in home runs while also finishing second in extra base hits (26), third in RBI, tied for third in total bases (100) and fourth in slugging percentage during his first professional season...Hit seven of his 10 home runs during the month of July...Hit first professional home run in his fifth career game on 5/24 against the VSL Mariners...Played exclusively in the outfield, making 53 appearances in right field and one in left. 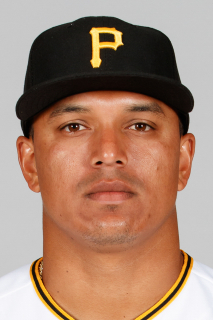 March 28, 2019 Pittsburgh Pirates placed 3B Jose Osuna on the 10-day injured list retroactive to March 25, 2019. Lower neck discomfort. December 3, 2018 3B Jose Osuna assigned to Bravos de Margarita. September 1, 2018 Pittsburgh Pirates recalled 3B Jose Osuna from Indianapolis Indians. August 8, 2018 Pittsburgh Pirates optioned 3B Jose Osuna to Indianapolis Indians. July 28, 2018 Pittsburgh Pirates recalled Jose Osuna from Indianapolis Indians. July 2, 2018 Pittsburgh Pirates optioned 3B Jose Osuna to Indianapolis Indians. June 18, 2018 Pittsburgh Pirates recalled Jose Osuna from Indianapolis Indians. May 26, 2018 Pittsburgh Pirates optioned 3B Jose Osuna to Indianapolis Indians. May 8, 2018 Pittsburgh Pirates recalled Jose Osuna from Indianapolis Indians. April 27, 2018 Pittsburgh Pirates optioned 3B Jose Osuna to Indianapolis Indians. April 25, 2018 Pittsburgh Pirates recalled Jose Osuna from Indianapolis Indians. March 26, 2018 Pittsburgh Pirates optioned 1B Jose Osuna to Indianapolis Indians. November 18, 2017 OF Jose Osuna assigned to Bravos de Margarita. April 18, 2017 Pittsburgh Pirates recalled 1B Jose Osuna from Indianapolis Indians. April 2, 2017 Pittsburgh Pirates optioned LF Jose Osuna to Indianapolis Indians. November 5, 2016 Pittsburgh Pirates selected the contract of Jose Osuna from Indianapolis Indians. October 5, 2016 LF Jose Osuna assigned to Bravos de Margarita. June 30, 2016 LF Jose Osuna assigned to Indianapolis Indians from Altoona Curve. March 18, 2016 1B Jose Osuna assigned to Pittsburgh Pirates. September 29, 2015 1B Jose Osuna assigned to Bravos de Margarita. May 29, 2015 1B Jose Osuna assigned to Altoona Curve from Bradenton Marauders. March 8, 2015 1B Jose Osuna assigned to Pittsburgh Pirates. October 7, 2014 1B Jose Osuna assigned to Bravos de Margarita. June 3, 2014 Bradenton Marauders activated 1B Jose Osuna from the 7-day disabled list. May 4, 2014 Bradenton Marauders placed 1B Jose Osuna on the 7-day disabled list. April 2, 2013 1B Jose Osuna assigned to Bradenton Marauders from West Virginia Power. April 4, 2012 Jose Osuna assigned to West Virginia Power from State College Spikes. October 10, 2011 1B Jose Osuna assigned to Navegantes del Magallanes. October 10, 2011 Jose Osuna roster status changed by Navegantes del Magallanes. September 3, 2011 Jose Osuna assigned to State College Spikes from GCL Pirates. June 19, 2011 Jose Osuna assigned to GCL Pirates. May 13, 2010 VSL Pirates signed OF Jose Osuna.